Our double queen suite is fitted with two comfortable queen beds and a sofa bed making this suite an ideal choice for small groups or families. This suite is fitted with complimentary WiFi, wireless printing, laptop safes, charging stations, modern décor, microwaves and refrigerators, and in-room coffee. A complimentary full hot breakfast is included with this suite. The accessible features in this ground floor suite include an accessible tub, visual doorbell alert, a visual alarm, and a visual telephone alert. This suite is fitted with a plush king size bed and can comfortably accommodate up to four guests. The separate living room is furnished with a sofa bed, coffee table and a work desk with an Ergonomic chair. 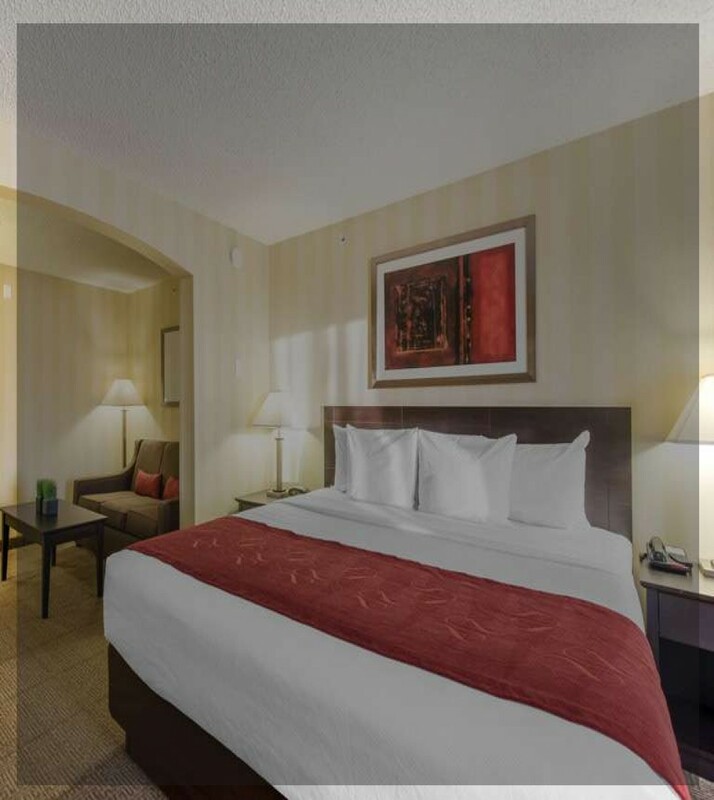 Additional conveniences include complimentary WiFi, wireless printing, laptop safes, charging stations, modern décor, microwaves and refrigerators, and in-room coffee. A complimentary full hot breakfast is included with this suite. This suite is ideal for guests who want hearing accessible features and can comfortably accommodate up to four guests. The separate living room is furnished with a sofa bed, coffee table and a large work desk. Accessible features that come with our hearing accessible suite are a visual doorbell alert, visual alarm alert, and a visual telephone alert. Additional conveniences include complimentary WiFi, wireless printing, laptop safes, charging stations, modern décor, microwaves and refrigerators, and in-room coffee. A complimentary full hot breakfast is included with this suite. The mobility features of this spacious ground floor suite include a roll-in shower, visual doorbell alert, visual alarm alert, and a visual telephone alert. This suite is fitted with a plush king size bed and can comfortably accommodate up to four guests. The separate living room is furnished with a sofa bed, coffee table and a work desk with an Ergonomic chair. Additional conveniences include complimentary WiFi, wireless printing, laptop safes, charging stations, modern décor, microwaves and refrigerators, and in-room coffee. A complimentary full hot breakfast is included with this suite.